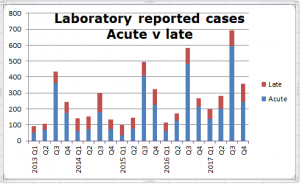 In November we reported a rise in the number of reported cases of Lyme disease. This clearly wasn’t just a blip as figures for the last quarter of 2017 have just confirmed the trend. Public Health England (PHE) has published its latest figures for Common Animal Associated Infections in 2017. 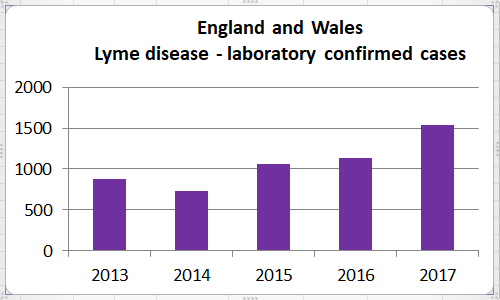 The fourth quarter report (England and Wales) for 2017 shows a 35% rise in laboratory confirmed cases of Lyme disease over the numbers for 2016. These cases are only those diagnosed via a positive blood test. There is no data on those diagnosed on clinical grounds. PHE acknowledge that they do not know whether this is caused by better awareness, and vigilance, or a genuine increase in the incidence and/or prevalence of the disease. It seems likely to us that it is probably a bit of both. If it is just down to increased awareness then it is undeniably a Good Thing, because that means more Lyme patients are being identified and, hopefully, treated. Unfortunately nobody knows whether there are more ticks carrying more disease over more of the country – we’ll need a lot more research over several years to track the changes. The number of cases per head of population is significant in the South-West of England. While recent headlines have highlighted increased cases in the South-East and London, these parts of the country also have more people. Per head of population the South-West has substantially more cases of Lyme disease than either. 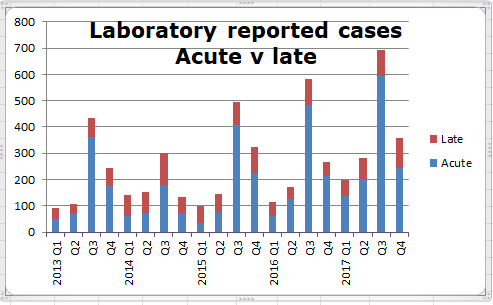 It is notable that nearly one third of the October-December cases are classified by PHE as “late” cases. It must not be forgotten that there will be a lot of cases not represented in these figures because they were diagnosed on the appearance of an erythema migrans rash, but none the less these figures are important because it is known that late diagnosis often results in protracted illness and incomplete recovery. 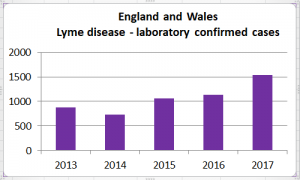 There is no data on the outcome for late-diagnosed cases of Lyme disease and LDA would like to see NHS England following up cases over at least 12 months following treatment. How many are really restored to full health? Which treatment regimen works best? How often does relapse occur? These are fundamental research questions, all of which were raised in our James Lind Alliance project. With increasing awareness it is hoped that eventually all cases will be diagnosed and treated early. Since PHE started reporting this split, the proportion of patients diagnosed late seems to be dropping.. just. Whatever the underlying cause of the increase, more cases will bring more pressure on the NHS to treat, and to treat effectively. While NICE is close to publishing the first ever full UK Guideline on diagnosis and treatment of Lyme disease it is critical that GP practices are not only ‘up to speed’ on this complex disease, but also aware that the NICE Guideline acknowledges the paucity of good quality evidence on which to base treatment. LDA pays to maintain the RCGP e-learning module freely accessible to all health professionals. Please let everyone at your GP Practice know about this important educational resource.